The Research Alliance for New York City Schools is conducting an in-depth evaluation of the iMentor College Ready Program in eight New York City high schools. With support from the Social Innovation Fund, the Research Alliance is examining iMentor's roll-out and implementation in these schools, as well as its impact on a range of outcomes related to students' preparation for college. This report is the first in a series from our evaluation. It focuses on iMentor's first year of implementation, which targeted 9th graders in all eight schools. 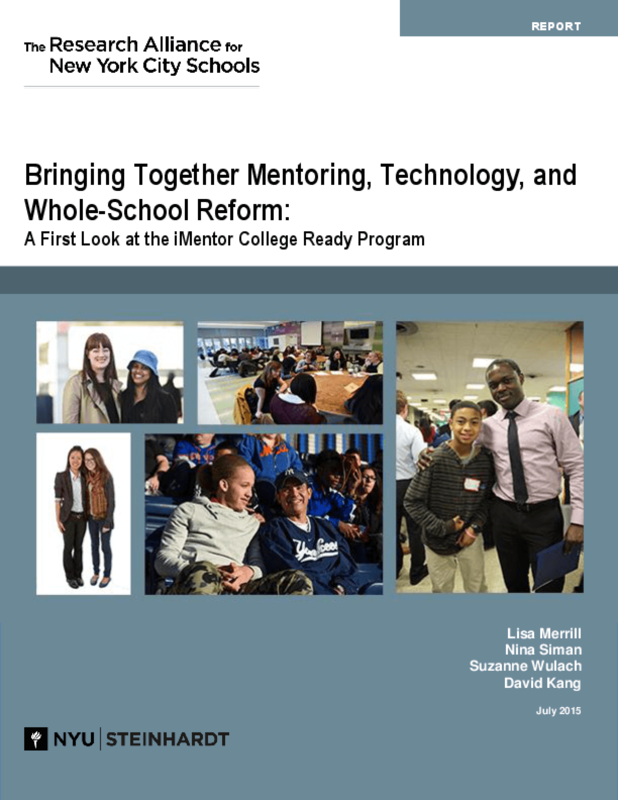 The report provides a detailed description of the four key components of the iMentor College Ready Program and assesses the implementation of these program elements against specific benchmarks established by iMentor. The report also presents a first look at iMentor's effects on 9th graders' outcomes, including their perception of adult support, their aspirations for the future, a set of important college-related "non-cognitive" skills, and several markers of academic achievement.